Priced at $379 Unbelievable deal!! 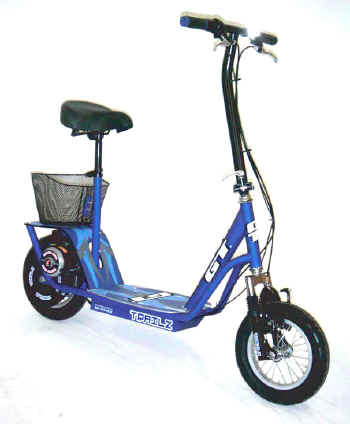 The 2004 GT Trailz Electric Scooter is an all around fun vehicle. Unique stand-up or seated scooter with easy-on, easy-off seat assembly .This electric scooter features the new downtube console with convenient on-off switch, lightand charger port relocated for easier access. Top-end speed is approx 15 MPH and this high torque motor will provide outstanding climbing capability. This electric scooter comes with a removable seat kit which makes this an outstanding value. New and improved with the rear band brake. Folding handlebar allow easy transportation in any car, plane or boat. Fully recharges in 3-4 hours with standard charger. Optional chargers available.